Cultivate Michigan’s first product promotion tour took place in July, highlighting blueberries, the featured food for summer 2014. 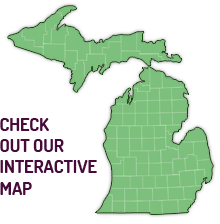 Farmers on the Move, based in Bangor, Michigan, is a Mexican farmers cooperative selling fresh produce to businesses and institutions. The fourth Cultivate Michigan Product Purchasing guide is now available and is featuring Michigan-grown apples. A recent Cultivate Michigan apple orchard tour in southeastern Michigan highlighted the importance of the apple crop. Beaumont Health System has embraced the opportunity to include Michigan fruit and vegetables on patients’ plates and cafeteria options! Hospitals promote health and disease prevention by supporting healthy food environments. Local farmers want to increase sales to large institutional markets. New network is helping schools, hospitals, day care centers, senior living and other institutions ramp up purchases of locally grown food. The Michigan Small Business Development Center named Cherry Capital Foods the best small business in Northwest Michigan for 2013!